Carl and Genevieve shared their large detached period brick house with daughter Lauren and her young family but needed to create an annexe that they could move into as they approached retirement age. 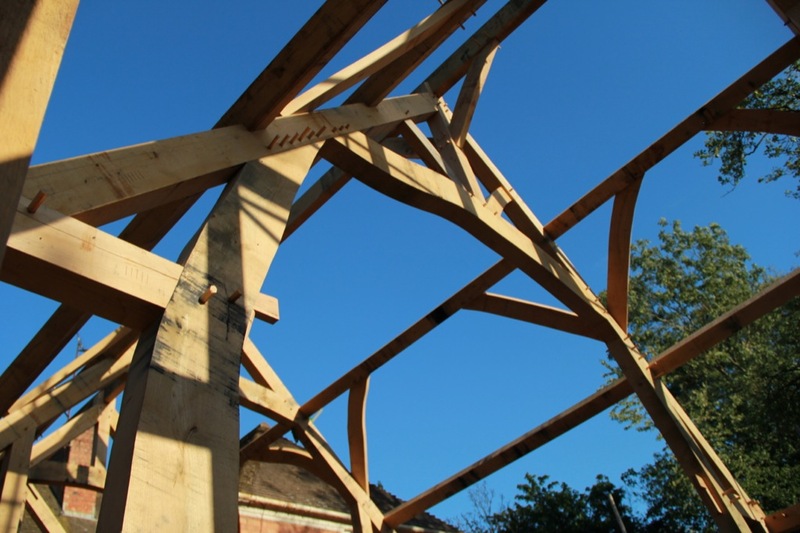 Having gained planning permission for a spacious single storey extension with glazed gable and vaulted roof, could they find a timber framer who could design and build a suitably impressive frame that didn’t consume too much of an already restricted budget. With plenty of time on their hands they patiently shopped around, travelling the length and breadth of the country visiting self build shows and framing companies before settling on Castle Ring Oak Frame. Not only were we able to design the frame, but we also provided suitable detailing for the wall and roof hair loss construction to enable the builder to complete the project. Rob also advised Carl and Genevieve on glazing the huge gable frame (7m wide x over 6m tall), putting them in touch with John Mcneil, an experienced “direct glazer” who was able to apply the glass to the outside of the oak frame once it was up. The main feature of the frame is the two huge sling braces which rise from the floor soaring upwards into the roof space towards a curved collar. The frame and green oak porch took 6 weeks to complete in the workshop and just over a day to raise, to the surprise and delight of the whole family.